I received a request today to publish my lasagna recipe. Of course I already have a couple of different lasagna recipes published in two of my cookbooks, but because I am feeling kind, here it is. It is a huge and delicious lasagna. Not for the faint-hearted. For serious cooks only. I allowed my imagination to run wild when I mentally constructed this multi-layered, deep-dish lasagna before embarking on my test kitchen procedures. You may like to substitute different vegetables in some of the layers. Thin slices of butternut pumpkin can be successfully grilled and added, as can slices of zucchini. 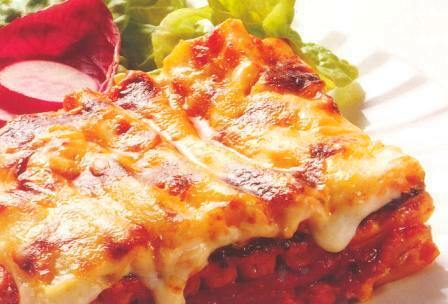 Select a casserole dish 25cm x 35cm x 8cm (10-inches x 14-inches x 3½-inches) deep for this ‘Queen of Lasagna’. ½ cup sun dried tomatoes sliced into strips. ½ cup grated Parmesan cheese, or something equally pungent, plus 3 tablespoons reserved. Pour the olive oil into a large, heavy-based saucepan and set it over moderate heat. When the oil is hot, sprinkle in the yellow asafetida powder, fry momentarily, then add the basil leaves and oregano, and fry for another 30 seconds. Pour in the puréed tomatoes, stir to mix and bring to the boil. Add the salt, black pepper, sugar and tomato paste, reduce the heat slightly and cook, uncovered, stirring often for 10-15 minutes, or until it reduces and thickens. Melt the butter in a 2-litre/quart heavy saucepan over low heat. Stir in the nutmeg, black pepper and flour, and fry, stirring constantly, for about half a minute or until the mixture loosens. Remove the saucepan from the heat, and gradually pour in the warm milk, stirring with a whisk until it is all incorporated and the sauce is smooth. Return the sauce to moderate heat and bring to the boil, stirring. Reduce the heat and simmer for about 5 minutes, stirring constantly, until the sauce develops a thick custard-like consistency. Combine all three cheeses (except the reserved Parmesan). Divide the cheese into 2 portions, the tomato sauce into 3 portions, the bechamel sauce into 4 portions, and the pasta into 5. Spread one portion of the tomato sauce on the bottom of the oven-proof casserole dish. Place a portion of the pasta on top. Layer the eggplant slices on top of the pasta sheets. Spread on a portion of the bechamel sauce, then another of the pasta. Sprinkle on half the grated cheese. Continue layering as follows: a portion of the tomato sauce; the sun dried tomatoes; the capsicum; another portion of the pasta; another of the bechamel; another of the pasta, then the remaining cheese. Layer the spinach leaves on top of the cheese. Spread on the remaining tomato sauce, top with the last pasta sheets and the remaining double portion of bechamel (this white sauce layer needs to be thicker than the others). Sprinkle the top with the reserved Parmesan cheese, place the lasagna in the top half of a pre-heated 200°C/390°F oven. Bake for 45-60 minutes, or until the top is slightly golden and the pasta yields easily to a knife point. If the lasagna is darkened on top but does not yield fully to a knife point, cover the lasagna with brown paper or aluminium foil in the last 15 minutes of cooking. When the lasagna is done, leave it in the oven with the door ajar for at least 30 minutes more to allow the lasagna to “plump” up and set. Cut and serve as required.